Win-Holt 7129 Polyurethane Wheel 6"
TigerChef > Storage > Storage Racks > Sheet Pan Racks and Accessories >< Caster Wheels > Win-Holt 7129 Polyurethane Wheel 6"
✔ Precision molded thread mechanically interlocked to a ribbed poly core✔ Core contributes to the wheel's high impact strength✔ 800 lb. rolling capacity per wheel✔ Dimensions: 6" x 2"
$16.99 Win-Holt 711 Mold On Rubber Wheels 6"
$31.99 Win-Holt 7115 Mold On Rubber Wheel 6"
$24.99 Win-Holt 7119 Phenolic Wheel 6"
$14.99 Win-Holt 7120 Poly Wheel 6"
$9.39 Win-Holt 716 Rubber Wheel 4"
$29.99 Win-Holt 73111 Swivel Plate Caster with Polyolefin Wheel 6"
$31.99 Win-Holt 73111BK Swivel Plate Caster with Poly Wheel and Brake 6"
$71.99 Win-Holt 73161 Swivel Plate Caster with Mold On Rubber Wheel 8"
$29.99 Win-Holt 7412 Rigid Plate Caster with Polyolefin Wheel 6"
$25.99 Win-Holt 746 Rigid Plate Caster with Phenolic Wheel 6"
$33.99 Win-Holt 7462 Rigid Plate Caster with Mold On Rubber Wheel 6"
$25.99 Win-Holt 756 Swivel Threaded Stem Caster with HD Polyurethane Wheel 5"
$31.99 Win-Holt 7128 Polyurethane Wheel 5"
$11.69 Win-Holt 7125 Polyurethane Wheel 4"
$29.99 Win-Holt 7130 Polyurethane Wheel 8"
$18.99 Win-Holt 7537 Rigid Round Stem Caster with HD Polyurethane Wheel 5"
Perfect for easily maneuvering utility carts or bulk movers, the Win-Holt 7129 Polyurethane Wheel 6" is a must-have in any commercial establishment. This wheel has a precision molded thread that is mechanically interlocked to a ribbed poly core. Designed with exceptional strength in mind , this wheel will withstand heavy impact and can carry up to 800 lbs. of load. 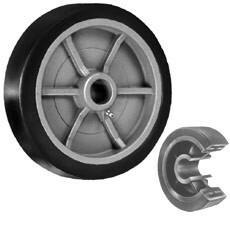 An economical and practical option, this polyurethane wheel will withstand years of use and requires little maintenance.